I’m an artist. I have art supplies squirreled away in twelve drawers and three or four shelves of places in my office. I have grade books and sketchbooks and notebooks, both used and unused — things gifted to me, purchased, and recovered from the ‘unused bin’ at the end of the school year. A vast pile. 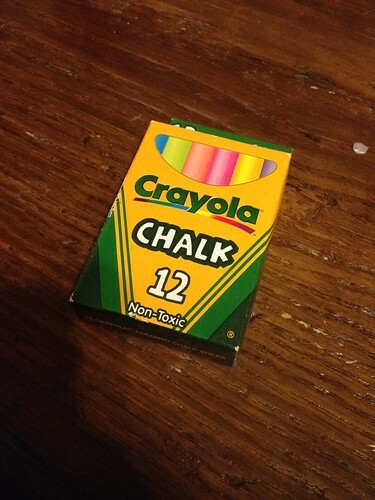 And yet, when I decided it was time to follow through on the magical work of the day… I couldn’t find any chalk. I’m a teacher. The first fifteen years of my career were spent breathing in chalk dust like it was incense and I was a magician summoning angels. I was, actually: the word angel comes from the Greek word for ‘messenger’, and at some level I hoped that the act of scribing symbols, words, phrases, or diagrams or images on the chalkboard would somehow invoke the spirits of learning into my students. And the moment you watch the lights go on in a student’s eyes when they get something you just said, well… that’s magical. So where did all the chalk go? There must be some around here somewhere?? Some finally turned up. I had to hunt in all the drawers and all the shelves before it turned up — practically in a locked filing cabinet in the back office of the basement where the lights and stairs had gone, and there was a sign saying “beware of the leopard.” But I did find some. It’s in a remarkably pristine box, given where I found it. And the chalk itself has milled so well, I can feel the moisture leaching from my fingers the moment I pick it up. This chalk conforms to a particular standard. Specifically, it’s standard D-4236 of the ACMI, which certifies that it complies with certain safety standards. It also bears the words Non-Toxic on the container. Perfect. I can use it outside. Which I do. I’d show you, but… Let’s talk about that for a moment. Putting up a chalk mark in a place that doesn’t belong to you, on a thing that doesn’t belong to you, is a bit of a radical act these days. It’s saying, “I know what’s what around here, in a way that the actual owners of this property don’t.” It’s placing something that’s not really intended to be read, in public space where it can be seen. There was a whole system of codes uses by hobos, and another one created by hackers, for labeling a town in secret ways to communicate with the next visitors: Mean dog here, nice grandmotherly type who will feed you there, and the easy wi-fi access point is here. In The Lord of the Rings, in the Fellowship of the Ring, Gandalf is leading the group across the pass over Caradhas (sp? ), and he is forced to use his magic to make a light and bring fire and warmth to the group. This upsets him, because he acknowledges that he has now written in giant characters, a message that pins him down: “Gandalf is here.” You could put a pin in a map based on information like that… and in a world without automobiles, the widening circles of days and weeks out from that point, creates a limited bubble in which to move. This is the mindset that came over me as I put up my sigil. Each time I did so, there was a chance I’d be noticed, or caught. Until it snows or rains, each time I made a mark, there’s a widening opportunity than someone will see it and ask what it means. Here I am, in plain sight, writing a column on the internet day after day about my activities, my work, my thinking, my philosophy, my efforts — and the act of drawing a mark in chalk, in a place where I know it will wash off eventually, literally changed what I was thinking about and why: will I be caught? Will I be changed by this? Will the magic work? I was more worried about getting caught. WHat’s the right balance between sneakiness and silence on the one hand, and not looking suspicious on the other? I’m an older white guy who usually wears a tie and a sweater vest. I can rock the ‘out for an evening stroll’ look with ease and accomplishment. It makes me think about others who can’t even walk around the block without rousing suspicion. Maybe Gordon has the right idea, though. Sometimes a podcast is easier.